40 mm stainless steel case, 11.52 mm thick, screwed back, sapphire crystal on top and bottom, silver dial with black Roman numerals, railroad chapter ring and blued hands, Calibre 100-03 automatic movement hour, minute and second, reset function, Panorama Date, approximately 48 hours of power reserve, black alligator strap, folding buckle with stainless steel. Water resistant to 5 bar. 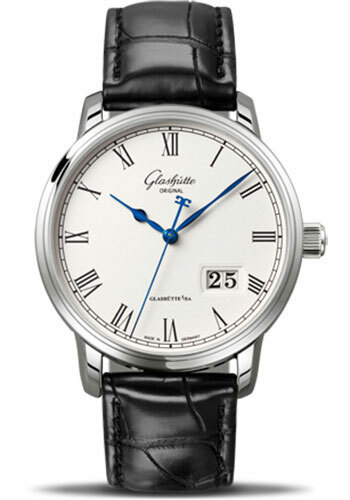 40 mm stainless steel case, 11.52 mm thick, screwed back, sapphire crystal on top and bottom, silver dial with black Roman numerals, railroad chapter ring and blued hands, Calibre 100-03 automatic movement hour, minute and second, reset function, Panorama Date, approximately 48 hours of power reserve, metal bracelet, folding buckle with stainless steel. Water resistant to 5 bar. 40 mm 18 ct red gold case, 11.52 mm thick, screwed back, sapphire crystal on top and bottom, silver dial with black Roman numerals and blued hands, Calibre 100-03 automatic movement hour, minute and second, reset function, Panorama Date, approximately 48 hours of power reserve, black alligator strap, folding buckle with 18 ct red gold. Water resistant to 5 bar.